You can display ads to specific users. Data can include various audience segments from Yandex.Audience. To set up segments (other than those based on provider data), your audience coverage during the 28-day period preceding your presumed ad-launch date should consist of at least 20,000 unique users. When you choose segments of different types, they are joined using “AND”. In other words, a user (from the segments) will be chosen who fits all the chosen segment types simultaneously. When you choose several segments of a single type, they are joined using “OR”. In other words, a user (from the segments) will be chosen who meets at least one of the chosen conditions. Upload data to Yandex.Audience about potential clients that you'd like to target and create a segment. Alternately, you can use a pre-existing segment. The advertiser's employee has to own the segment or have access to it. For more information about access, read the Managing access to segments section of Yandex.Audience. Mark the segments that you want to use as targeting criteria in the Targeting criteria table. Segments within a single type are joined using “OR”. Make sure that the selected segments (with the exception of segments based on provider data) cover at least 20,000 users. You can prohibit ads from being served to certain segments of users (depending on the segment type). If a user is included in at least one of the segments that was marked, the ad will not be served to them. 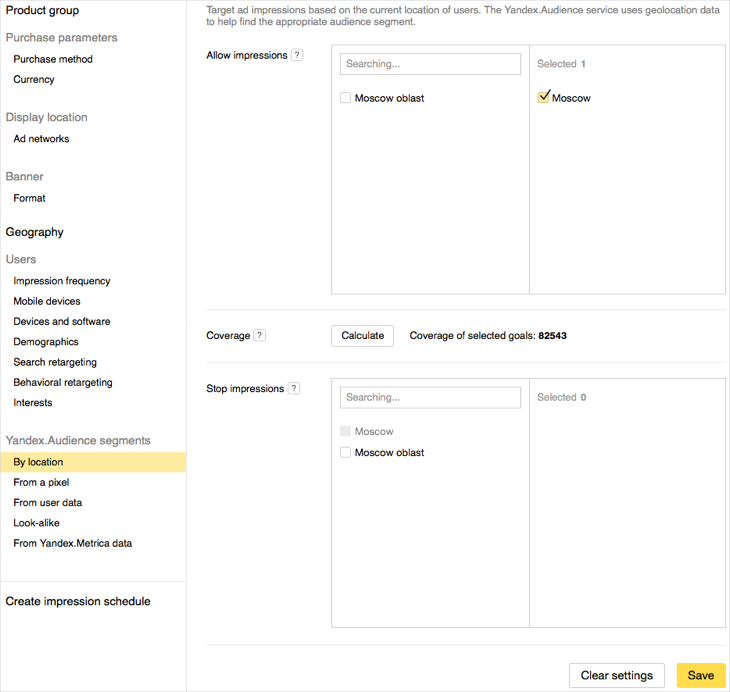 In the Criteria for stopping impressions table, mark the user segments that you want to forbid ads from being served to. Segments within a single type are joined using “OR”. A segment based on data about users from certain locations is used as a targeting criteria. For more information about this segment type, read the Segments based on location data section of Yandex.Audience Help. A segment based on pixels is used as a targeting criteria. For more information about this segment type, read the Segments based on pixels section of Yandex.Audience Help. A segment based on uploaded data is used as a targeting criteria. For more information about this segment type, read the Segments based on your own data section of Yandex.Audience Help. A segment based on one of your own segments is used as a targeting criteria. Yandex.Audience selects users with similar interests and online behavior. For more information about this segment type, read the Similar user segment section of Yandex.Audience Help. A segment based on your counter data or data from a counter that you have guest editing access to is used as a targeting criteria. For more information about this segment type, read the Segments based on Yandex.Metrica data section of Yandex.Audience Help. A segment based on provider data (from a DMP — Data Management Platform) is used as a targeting condition. 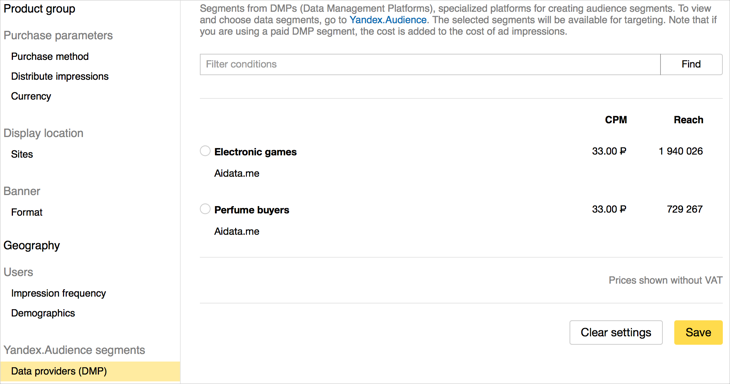 For more information about this segment type, read the Segments based on DMP provider data section of Yandex.Audience Help. There are free and paid segments. The price for paid segments is given for one thousand impressions (CPM). The cost of a segment is fixed after a line's status changes to “Flight” (for more information, read the Send line for confirmation section). If you choose a paid segment, it's cost will be added to the cost of the line. If a DMP segment was rejected or deleted by the data provider, then you will get an email notification. If 30 days pass since the segment was rejected or deleted, the line will be paused.